With a complete line of moving services, Meathead Movers will get you settled in your new home. Our clean-cut student-athlete Martinez movers are dedicated to fulfilling all your moving needs to your satisfaction. 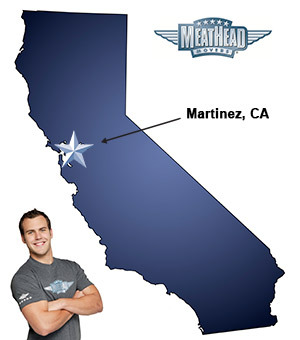 Welcome to Meathead Movers of Martinez! If you are moving to or from anywhere in California, we are the moving company for you! Our professionally trained student-athlete Martinez movers and our moving concierge service are here to help you with every stage of your move, no matter where you end up. Located along the edge of the Sacramento and San Joaquin rivers, Martinez is the county seat of Contra Costa County. Since its humble beginnings in the early 1800’s, Martinez has long been a prosperous city. It used to serve as a ferryboat transition point and eventually evolved into one of the area’s most important trading and shipping ports. Once the home of naturalist John Muir and baseball legend Joe DiMaggio, Martinez has shaped the lives of great people and can also influence your life as well. Explore downtown Martinez and admire the beauty of the 20th century shops, go for a stroll along the beautiful Alhambra Creek, or check out the John Muir Festival Center. Also with over 16 city parks and a marina, residents have plenty of opportunities to get out and enjoy the great outdoors. If you are considering a move to this timeless town, Meathead Movers is here to help. Our moving company specializes in local, long-distance, and commercial moves to, from, and within Martinez. We also provide reliable packing, storage, on-site relocations, and our distinctive moving concierge service. All our student-athlete Martinez movers are thoroughly screened and trained before their first move. With branches not just in Martinez, but all throughout California, we are your one-stop resource for all your moving needs, no matter where your California move takes you. In fact, you can see what your neighbors in Martinez have to say about us! With our 100% satisfaction guarantee, the only thing you have to lose is the stress that comes from moving! Contact our Martinez movers today for a free moving quote and learn how we can help you on your next move! Moving to Martinez? Here are some helpful resources. The professionalism shown by the three members of your crew was exemplary. They did a masterful job at providing a safe, secure and protected moving experience. Very careful, professional, organized and efficient, by far the easiest move we have ever made.